Located just off of US 24, directly across from Lutheran Hospital, Indiana Wesleyan University's Fort Wayne Education and Conference Center holds classes on weeknights and Saturdays. Conveniently located near Fort Wayne hotels, this 17,100-square-foot facility also serves as a comfortable option among Fort Wayne conference centers for area businesses and organizations needing meeting rooms in Fort Wayne, as well as reserved space for workshops, events, conferences and other activities. One Space for all of your Needs: In addition to classrooms, study rooms, conference room spaces, and a break room with vending machines, a banquet hall is available to accommodate all of your events. All of the technology used in our state-of-the-art classrooms is available for your group's convenience, along with access to onsite vending and area caterers. 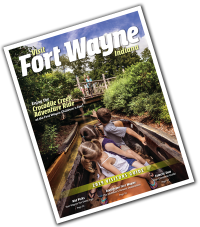 IWU's Fort Wayne conference center, located off exit 302 of Interstate 69, is the perfect venue for events, conferences and meeting room rentals for local businesses. The staff at the Fort Wayne Education and Conference Center is ready to meet your group's needs. Please give us a call or email to schedule an appointment for a personal visit and tour.